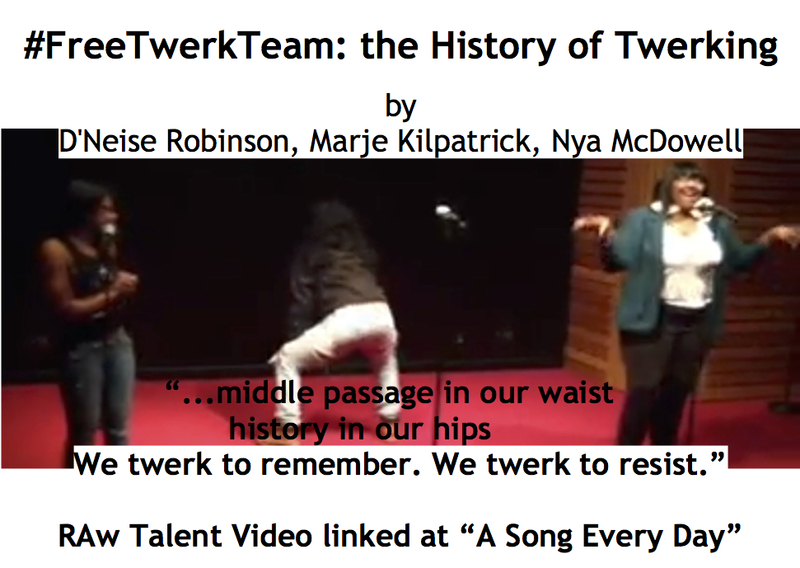 More Race and Gender and Strength and Boundaries (Beyond 13) | "A Song Every Day"
Posted on April 17, 2015 by vspatz	in Community, Counting the omer, Ethics, faith action, Gender, racism and tagged #FreeTwerkTeam, Alice Walker, bell hooks, counting-the-omer, Heidi Lewis, omer, Shemini, the Dance Hall (SN). It is worth noting, I think, that this woman-less portion closes out the week of Gevurah [“strength” or “boundaries”] in our omer journey away from oppression. Jews, and Jewish feminists in particular, have been grappling for a long time with the ways the Torah defines women, when it isn’t ignoring them entirely. And this seems a good time to focus our attention on the ways in which Black women have been defined by others when the narrative isn’t ignoring them entirely. No other group in America has so had their identity socialized out of existence as have black women. We are rarely recognized as a group separate and distinct from black men, or as a present part of the larger group “women” in this culture. When black people are talked about, sexism militates against the acknowledgement of the interests of blck women; when women are talked about racism militates against a recognition of black female interest. the focus tends to be on black men; and when women are talked about the focus tends to be on white women. And today, hooks’ observations apply in many places where race and gender and oppression intersect. (More on this as our journey continues.) But one key place revisited over and over is the media is the corner of sexuality and feminism. Well, one of the things that I would say is that I’m not really all that interested in labeling somebody else a feminist or not because black women have had a long history of being misnamed and mischaracterized by so many people outside of our communities. Toni Morrison has this great quote from her book “Beloved,” her novel “Beloved,” and it’s that definitions belong to the definers and not the defined…. …a lot of white women were not understanding that there might be a different African-American version of feminism in which a woman might want to use her body as a tool, not someone else use it but she use it as a tool, and it’s just that they could not recognize that. On a slightly related note, some words and images to close out this “strength” week of the omer journey. It struck me one day, while dancing that the marvelous moves African Americans are famous for on the dance floor came about because the dancers, especially in the old days, were contorting away various knots of stress. Some of the lower-back movements handed down to us that have seemed merely sensual were no doubt created after a day’s work bending over a plow or hoe on a slave driver’s plantation…. Shared some time back by ColorLines, a project of Race Forward. We counted 13 on the evening of April 16. Tonight, we count…. Today is fourteen days which are two weeks in the Omer. Hayom arba’ah asar yom shehaym shnay shavuot la-omer.